The Amish Writer’s Desk Series from Brandenberry Amish Furniture brings to life the world’s greatest writers. Featuring timeless designs and durable craftsmanship. The Dicken’s Writing Desk (shown below) captures the strength and simplicity of industrial-era London. It’s named for Great Britain’s greatest modern writer. Custom options even allow customers to select the exact wood options, stains or finishes, or even the type of hardware. Gracefully curved legs mark the Dickens Writing Desk. The Steinbeck Writing Desk features sturdy legs, a butcher-block top, and a sleek wood finish. America’s great dust-bowl-era novelist is where this desk gets its name. Furniture-lovers will love the fine craftsmanship and attention to detail. While literature-lovers will appreciate the way in which Brandenberry’s craftsmen captured the spirit of the world’s great writers. 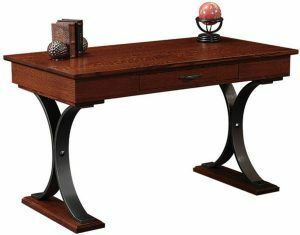 Visit Brandenberry Amish Furniture to see the complete selection of Amish writers desks.